Inappropriate elimination generally refers to a cat is urinating and/or defecating in the house in places other than its litter box. This can be caused by either medical problems or a behavioral disorder. Behavioral causes of inappropriate elimination fall into two common categories: 1) a dislike of the litter box or litter-box aversion, and 2) a stress-related misbehavior. One of the main reasons for this is because the litter box has become objectionable to the cat. This usually occurs because it is not cleaned frequently enough or because the cat does not like the type of litter in it. The latter is called substrate aversion. It can occur because the litter was changed to a new, objectionable type or because the cat has associated a stressful event (such as a sudden fright) with the type of litter. I feel that this is a problem that cannot be tolerated, even if the cat has to leave my house. Is that wrong? No. 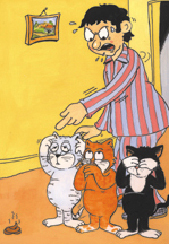 Many people are very proud of their home and are unable to tolerate house-soiling by their cat. However, before giving up your cat, you should discuss the problem with your veterinarian since there may be a simple solution to manage the behavior. In general, behavior modification techniques are either Aversion Therapy or Attraction Therapy. The former repels the cat from the inappropriate location, while the latter encourages the cat to choose an appropriate location. "The purpose of Aversion Therapy is to make the area of inappropriate urination or defecation undesirable for the cat." A product to neutralize the odor of urine or stool should be used in places where inappropriate urination or defecation has occurred. If the objectionable location is on a carpet, it is necessary to treat the carpet and the pad below because most of the odor will be in the pad. This usually means soaking the carpet with the neutralizing product so it penetrates into the pad. Test an inconspicuous area of the carpet to ensure that it won't be damaged before using any odor-neutralizing product. Cover the area(s) with double-sided tape or aluminum foil taped down to the carpet or furniture. 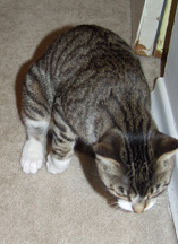 Aluminum foil or sticky surfaces are textures on which most cats do not like to walk. You can also purchase a pressure-sensitive mat that emits a loud noise or a very mild static electricity shock when the cat walks on it. If the soil in potted plants is being used, place a lemon-scented air freshener at the base of the plant. This will usually repel the cat. "The purpose of Attraction Therapy is to make the litter box more desirable than the inappropriate site." Purchase a new litter box; even well cleaned litter boxes have odor deep in the plastic. It is important not to use a litter box with a hood in cases of inappropriate elimination. Many cats find a hooded litter box undesirable. 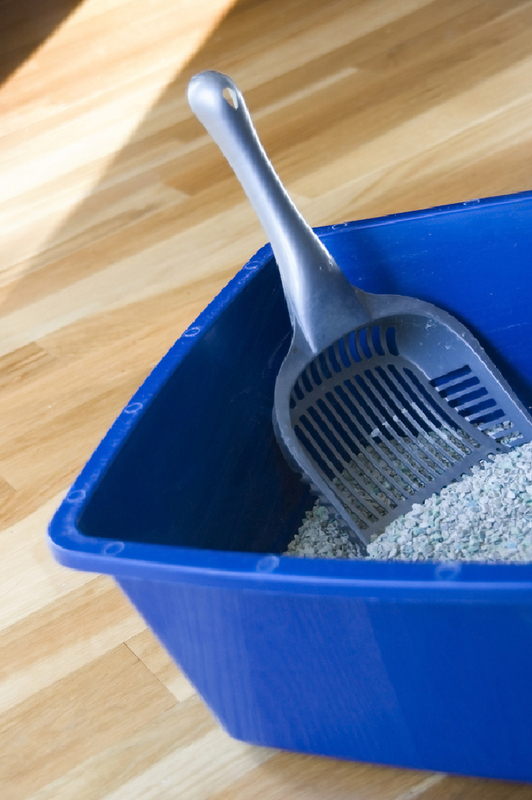 To increase the chances of your cat using the new litter box, purchase unscented clumping litter. Many cats prefer clumping litter to regular clay litter. And, although you might prefer a scented product, most cats do not. Place the new litter box near the area of inappropriate urination until it is used for several days. Then move it 2-3 feet (0.7-1 m) per day until it is back in the desired location. In some cases, the litter box may need to be moved shorter distances each time; in others, it may not be possible to relocate to the litter box. Keep the existing litter box in the normal location in case the aversion therapy causes your cat to return to it. What medications are available to treat inappropriate elimination? "These medications can cause serious side effects in cats. They are no longer recommended for use." In the past, hormones such as megestrol acetate and medroxyprogesterone acetate were used to treat this problem. These medications can cause serious side effects in cats. They are no longer recommended for use. Are anti-depressants and tranquillizers approved for this use in cats? No. All of these were developed for use in humans. However, most have been used on enough cats for long periods of time to give us reason to believe that they are relatively safe. I understand that buspirone has gained popularity recently. What is this drug? Buspirone (trade name Busparâ) is an anti-anxiety drug commonly prescribed by physicians for human patients. Although it is not a veterinary drug, it has been used safely in cats for well over a decade. Buspirone has been shown to be effective in a significant number of cats with elimination behavior problems. It is available only by prescription from a licensed veterinarian. For the average-sized cat, without other medical problems, the following dose schedule should be followed. If you are unclear about the schedule, please call the veterinary clinic for a more detailed explanation. 1. Give 5 mg (1 tablet) by mouth every twelve hours for 1 week. 2. If there is no response, give 7.5 mg (1 1/2 tablets) every twelve hours for one week. 3. If there is still no response, discontinue buspirone. 4. If there is a good response, decrease the dose to 5 mg every twelve hours for one week. 5. If there is good response, give 5 mg every twelve hours for eight weeks. If a relapse occurs after successful therapy, resume buspirone at a dose of 5 to 7.5 mg every twelve hours and continue for six to twelve months.